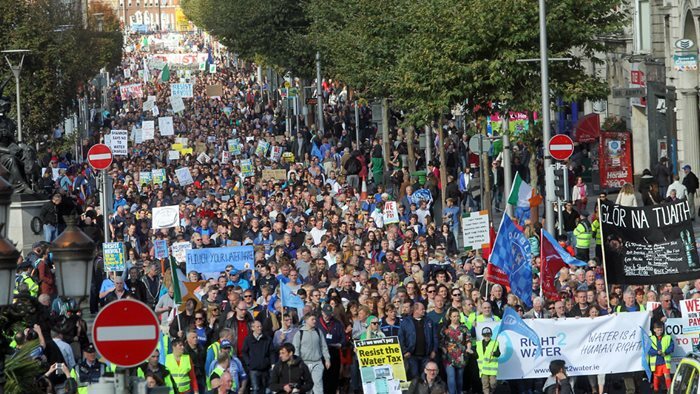 For more than a year, the Irish people have been engaged in a movement to protect their water. Right2Water. And the protests have been massive. 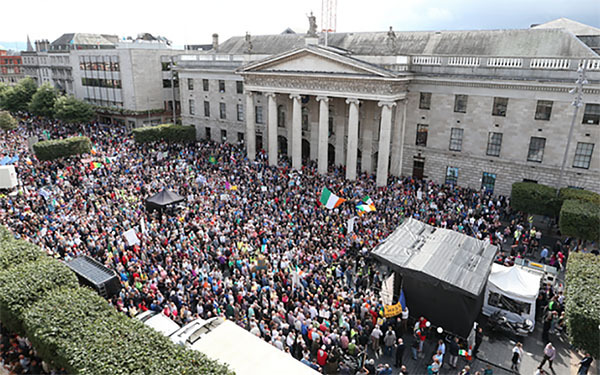 In August 2015 more than 80,000 people descended on Dublin. As this protest movement continues to fight a looming privitazation of their water, the Irish people are aligning themselves with the people of Standing Rock. And of course they would. I just watched a video, published this week, with the following text. Today Ireland repaid solidarity extended to us in 1847 by the Choctaw tribe as we extended that Solidarity to the tribes making a Stand at Standing Rock in North Dakota USA. Massive turn out no matter what RTE says. By the time I reached St Stephens Green the Quays were still blocked as thousands after thousands once more converged on Dublin City centre. We are only getting started. One notable thing about this video, which is a compilation of public marches and demonstrations across Ireland. In none of the demonstrations did I see a police presence. Oh, I imagine they were there somewhere. But not the looming militaristic robocop force we see at Standing Rock. The video text refers to the Choctaw nation. Some of you will recall that I wrote a blog post on this a year ago. Kindred Spirits. Thrown off their lands and living in abject poverty, it was the Choctaw people who pooled their resources and sent money to the Irish people who were, in 1847, starving and homeless. It was the time of the Great Hunger, the famine in Ireland. The Irish have a history of subjugation and a heritage of solidarity with others who are being oppressed. Today, that heritage of solidarity continues. May all beings have fresh clean water to drink. Thank you for this Judith……your words bring strength to my bones and courage to my heart.